Wohoo!! It's time for the first Nail Files post of 2013! TWENTY-THIRTEEN! Crazypants. 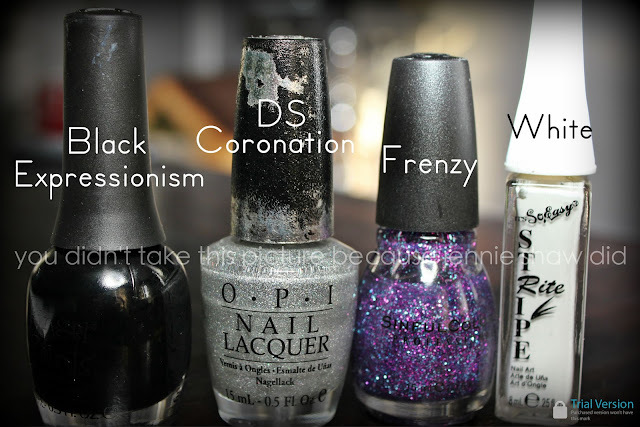 This week, I'm sharing my NYE manicure, inspired (yet again) by Pinterest. Seems complicated? 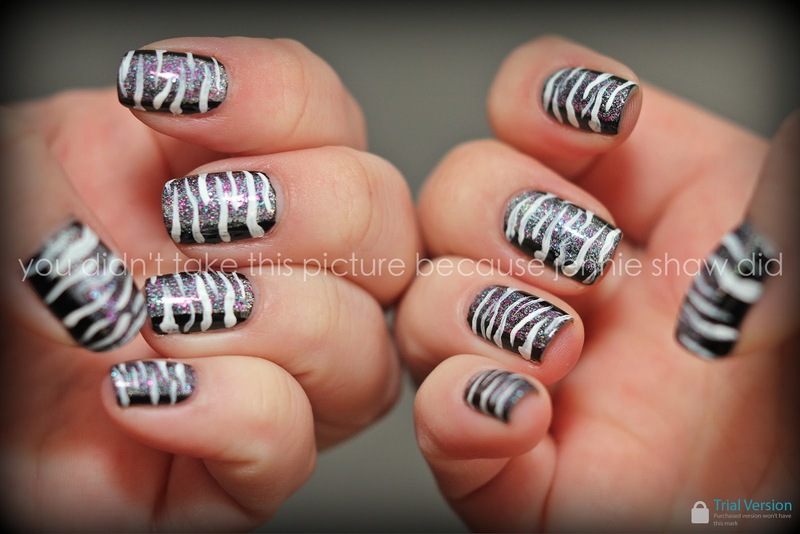 Rest assured, this is one of the easier nail art manis I've ever attempted! Seriously! One coat of Black Expressionism, one coat, down the middle of DS Coronation, followed by Frenzy. Then, random, swoopy stripes, alternating from one side to the other with White Rite Stripe. I was most amazed with how well my right hand turned out! The random nature of the stripes meant that if it wasn't a perfect line, it didn't matter! WHY CAN'T ALL MANIS BE LIKE THAT? Haha! Originally, I wasn't going to add the extra coat of Frenzy but I gave it a go on my plastic nail circle and the pink and blue sparkles really made it pop, so onto my mani it went. It's a subtle addition but one that I think worked out pretty well. These turned out awesome!! I actually like your white stripes better! I LOVE LOVE LOVE this mani! So adorable, and it does actually seem doable! I need to get me some of that white stripe stuff. :) Happy Friday! Your version looks amazing! Even better than the pinterest inspiration. :) I could never do something like this because the right hand would look so awful lol. Love how they turned out! You did an awesome job! I'm obsessed with the base color of your mani! Perfect for NYE! That looks amazing! I love seeing your nail art!!! OMG this came out Great I love it! I think yours looks way better with the white stripes and the darker base!